To kick off the week, I’ve got a few new American Airlines and oneworld related sweepstakes and blog contests to tell you about. I’ve even got my own reader giveaway today. American Airlines, the official airline of the hit show, ¡Q’VIVA The Chosen, has teamed up with the show’s producers to offer fans a chance to win a unique VIP experience to attend a live ¡Q’VIVA performance in the United States. ¡Q’VIVA! The Chosen follows superstar artists Jennifer Lopez, Marc Anthony and Jamie King as they travel through Latin America searching for extraordinary performers who hope to be among “The Chosen.” The singers, musicians, dancers, acrobats and other uniquely talented performers are given the opportunity to travel to Los Angeles for the chance to work with the superstars to produce a spectacular live show highlighting the artists from throughout the region. Filmed in three languages, ¡Q’VIVA The Chosen is being broadcast in 21 countries, and has now become one of the biggest new international TV shows of 2012. • Tickets for two to attend a live ¡Q’VIVA show in the U.S. in 2012, and enough American Airlines AAdvantage miles for their round-trip travel. • plus a $1,000 gift card to use during their trip. All entries must be received by 11:59 p.m. ET time on April 9, 2012. Go here to enter. A once-in-a-lifetime opportunity to walk up to the Hollywood sign for winner and a guest at 12:30 pm on March 22, 2012, including 45 minutes in the restricted sign area (courtesy of the Trust for Public Land); two Hollywood CityPASS booklets; two round trip economy class airline tickets to Los Angeles on American Airlines valued up to $500 total (subject to airline rules, availability and restrictions); one night stay accommodation (double occupancy, excluding incidentals and parking) at the Los Angeles Marriott Downtown. This contest ends today, March 19, 2012 @ 11:59 pm (PDT). Go here to enter. Etihad Airways, the World’s Leading Airline is delighted to invite you to join Etihad Guest – our award winning loyalty program. Etihad Guest, unlike other programs is designed exclusively around you. It’s more flexible, less restrictive, more responsive and much more rewarding. Join Etihad Guest any time between 28 February and 30 March 2012 and you stand a chance to win yourself two Coral Economy Class tickets to any destination on our network. So start planning your holiday and you could be that lucky winner flying free – whether it’s to the Maldives, Shanghai or Sydney – the choice is completely yours! Don’t miss out on this fantastic opportunity. I tried this earlier and got an error message when I tired to sign up. Hopefully, it’s just a temporary issue. Win a trip to Shanghai. In celebration of our new Shanghai services, we’ve teamed up with the five-star Shangri-La Hotel, Qaryat Al Beri, Abu Dhabi to give one lucky couple the holiday of a lifetime! The prize is a pair of Etihad Airways tickets to Shanghai from any Etihad destination in the world, including a two night stopover in Abu Dhabi. The winners will spend two nights in the luxurious Shangri-La Hotel, Qaryat Al Beri, Abu Dhabi and two nights in the Pudong Shangri-La Shanghai. The winners will enjoy a complimentary lunch or dinner for two at Shangri-La’s superb Shang Palace restaurants at both locations. Have your holiday pictures handy as this is a photo competition and we want to see where our fans live or have flown. UAE residents can also enter. Submit your photos by March 20 and the Etihad Airways team will shortlist our favorites for our fans to vote on. Go here for complete details. Register by March 20, 2012 to enter. On Monday’s we will concentrate on finding deals, fares, promotions, anything related to American Airlines, their oneworld Partners or AAdvantage partners. Find the best AA or related deal and submit it to the blog comments for a chance to win 2500 AA miles donated by American Airlines. (Only AA, oneworld, and their partner deals will be accepted on Monday’s). All others will be better off submitted on another day. Go here to share your AA related tip. Mrs. Deals and The Weekly Flyer have teamed up to give away American Airlines discount codes each Monday during the month of March. Double your chances today by visiting both Deals We Like and Points, Miles & Martinis. 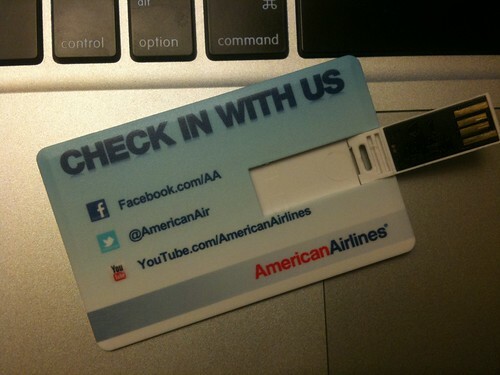 The AA social media team was nice enough to give me five USB cards with free codes for Gogo Inflight Wifi. I gave away two last week, so this week I’m giving away the remaining three. To enter, just post your answer to this question in the comments section: Have you ever won contest, sweepstakes, or giveaway? Tomorrow morning, I’ll have a random drawing to pick a winner and will announce the results Wednesday’s post. One entry per person. The deadline to enter is tonight, March 19, at 11:59PM Pacific. I have never won won a contest, sweepstakes or giveaway. All I have won is a few free lunches from dropping my business card at Baja Fresh and Chipotle. I won a cd once and a tv. the key to enter every contest available. Yes, I’ve won a USAirways Twitter contest for answering a question first. I’ve never even flown them. I have won a points giveaway before. Never won–but looking forward to it someday! Last year I won a Heineken Keg Tap from a facebook contest. When I was a kid I won a giveaway for a Huffy bike. At 10, it was pretty darn exciting. I won $100 and a turkey from a radio station when I was 13. A VERY long time ago I won a $50 gift certificate from Fairfield Inn on a website promotion! I’ve never won anything, but hoping this time will be the first! I never win anything. NEVER! NEVER! NEVER! well… there was that one time I almost… NEVER! I won 40,000 PC points last year on their Twitter contest. Never won anything that was of much value. I’ve won consolation prizes! When I was 15, I won a $25 dinner from a local radio station call-in contest. I took my mom. I have won a discount AA cert and a Bluetooth headset from bloggers in the past, and appreciate the chance for some free gogo! Yes – one time, I was lucky enough to win a 50″ plasma TV! i’ve won a giftcard for an SDOT questionnaire. Yes, lots of times & great prizes too! I won a free two night hotel stay, which I was really excited about! Hope I still qualify for this! I won a $50 Target gift card by entering a Huggies diaper code. My mom says I won the contest to be her favorite son (nevermind the fact I am her only son). Yes, I have won a contest, sweepstakes or giveaway. I have won a two night stay at the Four Seasons in Scottsdale including a meal at their premier restaurant and also, actually in the same giveaway, a walking tour for two from Context Travel in any city they operate. When I was a teenager, I used to spend a lot of time calling in to WPGC radio in the DC area when you had to be a certain number caller, and won things all the time! I only won a $5 Starbucks gift card before. 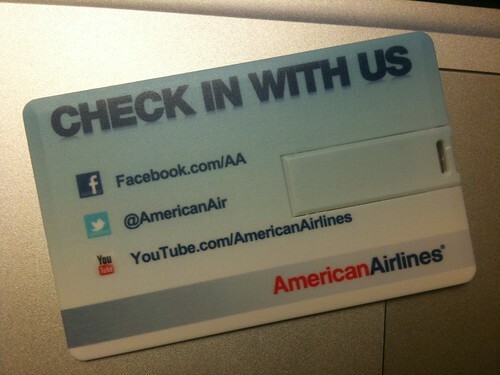 Yep, won an AA $150 gift card on Million Mile Secrets! I once won a hog calling contest on a cruise ship to the Bahamas… Woo Pig Sooie! not yet, but it would be a good time to start. I have never won anything significant. I’ve been fortunate enough to win a few things over time. Nothing big unfortunately. Yes, I win fairly often but I enter a lot of sweepstakes. I won a cabbage patch doll when I was 10 by filling out lots of entries in a drawing. They were so big then! never won anything would love to win this to have my yongest home for holidays! !